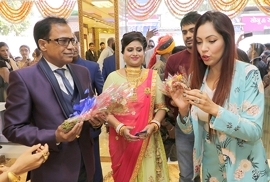 Sagwara, : Dhanraj Jewellers, a brand that embodies trust celebrated the launch of their first flagship store in Sagwara, the gorgeous actress Munmun Dutta Dhanraj Jewellers jewellery showroom in Sagwara (Rajasthan) today. Dhanraj Jewellers focusses on trust and authenticity over the years in Sagwara. Highlighting launch Vaibhav Gowadia, Pavan Gowadia MD & Chairman, Dhanraj Jewellerssaid, “We are delighted to have Munmun Dutta at our launch event and we take pride in our craftsmanship and enhanced the authenticity of our products to our valued customer. Our vision of being a family jeweller not just for Sagwara, Rajasthan but for the country will be possible with the support of our loyal and prospect customers, we believe that while the place will leave a pleasant and long lasting impression to all its visitors, it should also appeal to a broader canvas of customers ranging from the local to the international”. Dhanraj Jewellers is a new range of exquisite gold jewellery. The USP of the brand is its unbelievable designs encompass all types of traditional and contemporary categories. Actress wow fans on the occasion who were present in large numbers during the launch.